I have had Annette sit our precious dog, Sierra, on numerous occasions. Whenever I call her she has been very accommodating and professional. Best of all my dog loves going there and staying with her. She pulls me to her front door and comes home looking great and happy. I would highly recommend her as a sitter. Annette Filecci has taken care of our dog, Satori, a Belgium shepherd, on multiple occasions. He comes everywhere with me–even work and I love him dearly. My husband and I are very picky about who we trust to take care of him for a couple of reasons. We love him so much and only want the best for him. Secondly, although he’s a great dog and we’ve spent a lot of time on training which has more than paid off, he’s a powerful breed and smart. Because he’s so smart, he could pull the wool over a lot of humans eyes and get away it. Because he’s a powerful breed, we need to know that the person who is taking care of him has the confidence, knowledge and experience to handle a dog like this. Annette is all of these things. She has a ton of experience handling all types of dogs with confidence. She also has a genuine love for the animals and they pick up on it and love her back. When Satori sees Annette he runs up to her and bathes her in loving licks! Satori recently spent two weeks with Annette while we went to Mexico to get married and have our honeymoon. I didn’t worry one second about being so far away for so long while he was being cared for by Annette. I was confident that he was having a great time, which is exactly what happened. While staying with Annette, he is always so happy in her environment and fits right in with the family which gives my husband and I total peace of mind to enjoy our vacations. 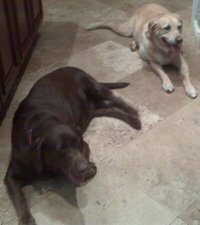 I have two labs, that take me for a walk. I called Annette to help me, after one of them dragged me when seeing another dog. After just a month of leash training, my dogs were letting me walk them!!! 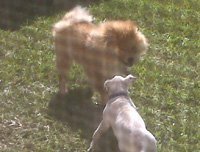 In addition, Annette is so loving with my dogs that, when they see her their tails don’t stop wagging! Besides all of her amazing pet loving qualities, Annette is a trust worthy person, who has a key to my house, so she can take my labs out during the day, while I’m at work! Anyone that uses Luckydogs petsitting is in for a treat! Lucky Dogs offers me peace of mind whenever I need to be away from home. Always very professional and responsive to our needs. For these reasons I highly recommend Lucky Dogs Petsitting Service. Annette and her family have been watching my dog during long weekends and vacation time for about a year and a half. I have left my 3 year old Swiss Hound, Fletch with her at least 6 times. Annette is always accommodating and loving with my dog. He always enjoys his time at her house, both with the other dogs and her children. 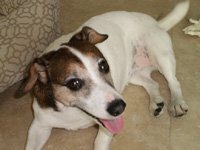 Annette offers reasonable rates and is even able to assist in the pick-up or drop-off of my dog if necessary. Thank you for the excellent care my “puppies” received. I was very happy with Annette Filecci. I plan to use her again soon. Its even better than being home! We recently moved to South FL and don’t know anyone down here and so we were nervous about finding a good place to leave our dog (Blue). We were used to leaving him with someone in the family and we were dreading having to start leaving him in kennels. We found Annette with Lucky Dogs Pet Sitting in a round-about way and could not be more happy with the arrangement. Leaving Blue with Annette is as good or better than leaving him with our family. His tail literally starts wagging when we turn onto her block. We say it’s like bringing him to camp. He loves her kids and I like that he sometimes gets to play with other dogs while he’s there so he gets to socialize. We’ve stopped bringing his crate because he prefers to snuggle up with Annette’s daughter–it’s even better than being home for him! My husband is in the Coast Guard and I travel for work so we often have last minute requests and she’s always available and able to take him. 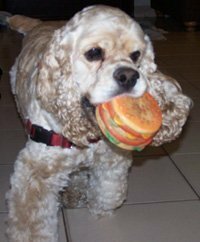 The prices are very reasonable and Annette is a great person for me to interact with and clearly comfortable and easy going with the dogs. She has my highest recommendation! 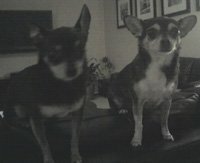 We have two chihuahuas (Sushi & Rocky) that she has been taking care of for over two years. Rocky doesn’t like anyone… but the photos she texts me of him receiving belly rubs from Annette shows that he loves her! I also truly appreciate her meticulous notes of her visits and the fact that she touches base with me during our time away. She always responds immediately when I have a question and is always there for us. Like most people, we consider our dogs family and we know that they are in good hands with Annette. Pepi is very active and loves to play. Annette’s children kept him busy all day playing ball and even allowed him to sleep with them at night. I highly recommend Annette and fell totally condident that Pepi is in good hands. On behalf of me & Colby, I can’t thank you enough for your help over the past few weeks. These have been some of the hardest weeks of my life & you have been a god-send – you are flexible, reliable and understanding of my financial situation. And you have loved Colby when I couldn’t be there. I am soo grateful! 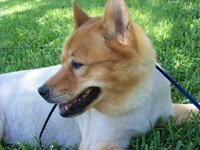 We have three dogs of various sizes and needs. 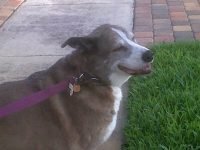 We love that when we are out of town we can depend on Annette to cater to each of the dogs individually making them happy at home without us which is a great relief to us as doggie parents. (Will text you pics if you ask) She is also very dependable, trustworthy and professional. Highly recommend. Job well done. Annette looked after our 3 cats while we were out of country for 4 days. This was our first pet sitting experience, and it went well beyond all our expectations. I know I can be demanding when it comes to our cats, and I’m aware that I made a “long & detailed” list of what I need from Annette for each individual cats. I was impressed on how punctual Annette was on timing and the details. She was also kind enough to take care of the community cats that I feed on a daily basis. She drove about 20 minutes twice a day to make sure our cats are well fed and had clean litters. I definitely recommend her services without a hesitation. 5 stars. Anyone would be lucky to use Lucky Petsitting Services! She was attentive about taking care of my pet and home while I was out of town and fulfilling whatever request I made. Well priced & Great job! I rely on Annette to take care of my dogs when I am on extended vacations. She is so reliable that it gives me complete peace of mind when I am away. I wouldn't leave my dogs with anyone else. She is very efficient, taking care of everything that needs to be done, and then some. Annette is a very pleasant person, easy to talk to, and she has a real love of animals. I am so glad that I found her to take care of my wonderful doggies. Annette is very friendly, professional, reliable and well priced. She loves what she does and treats your dogs like her own. We used Annette to let our dogs out, feed them and give them some attention in the evenings while I was out of town because my husband works long hours. She was flexible when we needed to change a few of the dates and we are using her again next month. We definitely trust Annette with our dogs. She even sent me texts with pictures of them!